Soon, many men will put their razors away for a month and grow out their moustaches as a way to raise awareness for prostate cancer and other men’s health issues. “Movember” is kind of a big deal around Cook Medical. Men from all across our company participate in this growing, global-awareness campaign. And while Movember is a campaign about men, it’s not just for men. Often, the women here have some of the most creative ideas to show their support. We’re hoping to build on our efforts from last year and would like you to join us for the next few weeks as we shine a spotlight on men’s health—and in particular, prostate cancer. Approximately 1.1 million men around the world were diagnosed with prostate cancer in 2012.1 That’s a number that nearly equals the population of Dallas, Texas.2 We’ll be sharing more on the topics of global incidence and the risk factors associated with prostate cancer in the coming weeks. Throughout Movember, we want to hear from you (and see you too). We encourage you to join the conversation and share your pictures with us on Twitter at @CookUro, on Facebook, or e-mail us at socialmedia@cookmedical.com. The Cook Medical ‘Stache Squad is another opportunity for you as well. If you form a team, we’d love to link up with you on our network over at the Movember Foundation. It’s a great way to stay informed throughout the month, to raise money for research, and to share and track your moustache progress. 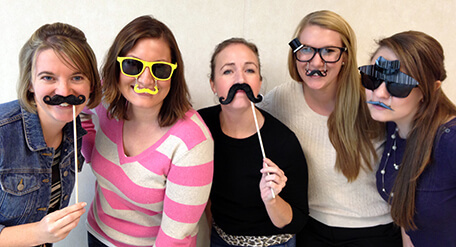 Download our favorite “mo’s” here and send us a picture of you sporting your stylish ‘stache. We’ll be sharing pictures throughout the month! 2United States Census Bureau “Population Estimates”. Retrieved May 25, 2015.